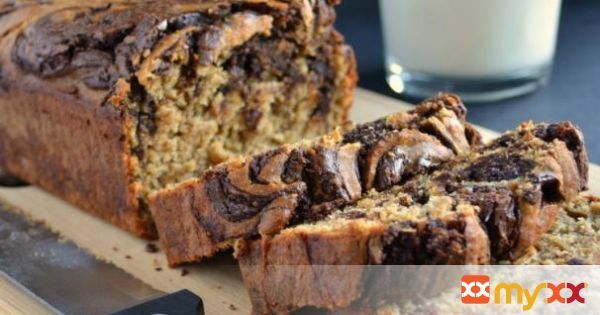 Moist, fluffy banana bread topped with a luscious chocolate swirl. You won’t believe that this delicious treat is gluten-free! 1. Preheat oven to 375º F (180º C). 2. Either grease a loaf pan directly with cooking spray or oil, or line the pan with parchment paper and then spray the insides. 3. Be sure to have at least half an inch of parchment paper above the loaf pan. 4. In a large bowl, mix the mashed bananas, oil, coconut sugar, eggs, yogurt, and vanilla together. 5. In another bowl, mix together the ground rolled oats (or oat flour), brown rice flour, psyllium husk, cinnamon, nutmeg, salt, baking soda, and baking powder. 6. Mix the dry ingredients with the wet ingredients. 7. I like to add the flour mixture in three batches. 8. In a microwave-safe bowl, melt the chocolate chips. 9. Set the microwave for about a minute and then check the chocolate. 10. Be careful with hot bowls! If the chocolate has barely melted, continue microwaving at 15-second increments until the chips are partially melted and very soft. 11. The chocolate doesn't need to be saucy--just melted enough so that you can stir the chips together into a creamy consistency. 12. Pour the banana batter into the loaf pan. 13. Add dollops of the chocolate sauce on top of the batter. 14. Using a butter knife, swirl the chocolate around so that you create a nice psychedelic swirl pattern. 15. Bake the bread for about 50-55 minutes, or until a toothpick comes out clean when you pierce through the banana bread portions. 16. Try not to test the bread by sticking the toothpick in the chocolate portions, as the toothpick will always come out with gooey melted chocolate. 17. Let the bread cool for at least 45 to 50 minutes before taking it out of the pan for slicing. 18. Store any leftovers in sealable container. Refrigerate any bread that you haven't finished in several days.